A friend of mine had his 1962 Thunderbird pop out of park into reverse at idle this weekend. Luckily no one was hurt and the car did not sustain major damage. 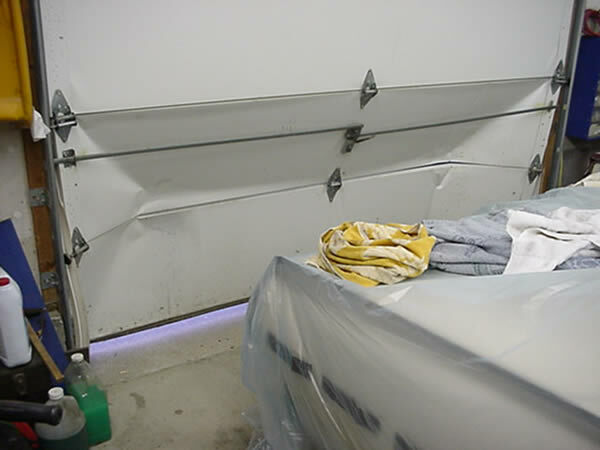 The door took the brunt of the crash. I plan on making an improved 61-63 Thunderbird detent plate similar the 58-60 one I have already produced. If anyone has new or used one lying around please send it to me. I expect to be able to make a new part in about two to three weeks. In exchange you will be the first to get a new 61-63 detent plate free-of-charge. RE: Why you need a new detent plate. This part is now available. See the ad in this month's Hemming's. It is $30 plus $2 shipping. This plate replaces your worn 1961-1963 Thunderbird detent plate (Part number 7A216). This is for all cars from these years equipped with automatic transmissions. This will keep your automatic transmission lever more securely in park and make gear selection less vague. This is not a reproduction. It is better than the original Ford part. The plate is made of .089 inch low carbon mill steel cut by CAM (computer-aided machining). It is a bolt in replacement that fits on the shift flange ( 3511 ) as shown below. The detent plate has an added stop made out of a 4-40 thread stainless-steel bolt and nut that is threaded into the detent plate and secured with cyano-acrylic glue. This is higher off the face of the plate and less likely to wear round with use than the original Ford stamping. The new detent switch fits all styles of detent plates from 1961 to 1963. Made in USA. It is better than the originals, if you can find one, as it is precision cut on a laser CNC machine. It is more precise and fits better than the original stamping. The slot for park is precisely the diameter of the shift lever end to keep your car more firmly in park. While conducting an inquiry about technical information, the Squarebirds website and your product were recomended by Alan Tast. I just ordered and received a Detent plate. Thanks very much for the prompt shipment. Keep up the good work. Do you have specific instructions for replacing the plate on the 61-63 'bird? The website download appears to be for the 58-60 version. I've started disassembly and got to the turn-signal switch mechanism and stopped, shot a digital picture to record assembly but thought I would play it a bit more conservative and ask before digging in any deeper. This is my first T-Bird. I picked it up last year and had some brief fun with it, but this detent-plate problem and other suspension work necessitates that I now get serious about working on the car. I look forward to the adventure. I joined WaterWOnderland T-Birds, a local T-Bird club and also the national club VTCI to obtain a better understanding of the vehicle, it's history and invlove my wife and I with other T-bird folk. Hopefully down the road I will be able to attend some of the various activities with the car and our paths may cross. Wow, Alan Tast recommended my site and my detent plates! That is quite a compliment. To make up the replacement 1961-63 detent plate I bought a shift lever, shift collar and shift flange and a variety of different 1961-63 detent plates, to make sure the replacement one would fit right and work right. I only have a 1959 and 1960 Thunderbird, and have not put in a detent plate in a 1961-63, but looking at the parts, it does not seem that there is much difference in how they are assembled. I would appreciate it very much if you would document your installation with pictures. I will post them. I'll give it a shot and be glad to respond. There is also another area that seems to affect this problem.. The Trans control selector bearing (which is more like a rubber grommet or a bushing around the steering column at the firewall) plays a role in supporting the steering column. A worn "bearing" lets alot of the weight of the steering column rest on the shift linkage. This along with a worn detent, helps shift it right out of park. The "bearing"/bushing is available for 10 bucks or so at most of the parts houses. I had this problem when I bought my 62 about 2 years ago. Turns out the shift lever can also get rounded off (there is a tab that I believe hits the detent plate) and it gets rounded off on the back. After that happens the lever can roll right between gears. I was told to test it by rolling through the gears - if there is little or no resistance when you hit each one, it could be the lever. I replaced mine and it has been fine since. Didn't mean to hijack your thread, just wanted to offer another point to look at if your car tries to get away from you. With your new shift lever, if you put in this redesigned detent plate, you will feel a difference. The shift lever will hold firmer in park. Well between general procrastination and other "honey-do" project work, I finally got around to replacing the detent plate on my '62. I also replaced the lever and rubber bushing, the collar (housing) seemed to be in pretty good shape so I didn't swap it out. WOW, what a difference. Nice clean engagement, positive stop between positions and a great piece of mind. It's been fun to cruise for the past couple months. The 58-60 replacement instructions worked fine as reference for my start & stop work. I did take a few reference snapshots during the dissassembly, unfortuantely focus was a bit unclear on a couple of the key differentiations between the 58-60 and the 62. Well now on to rebuilding the front suspension, lower control arm bushings are shot- along with other loosey-goose parts. Glad the detent plate has cured your shifting problems. Thanks for the compliment on my design. Are any pictures usable that you have? I would like to put up instructions for the '61-63. from Alexander on my 58 and to say it was like black and white, would be an understatement. The secure nature of this plate not only got rid of the " waggle " on the shift lever but also I now have full confidence, it when it is in park, it is in park. This in itself prevents any slippage do to wear. I would reccommend anyone, who is having these shift lever problems to invest, in these new detent plates from Alexander. I've got a '66, the same problem existed on it regarding slipping out of Park, from Reverse into Drive etc. I ended up using a new cutting disc on a grinder and made notches at the suitable locations on the detent plate, it was nerve-wracking but it all panned out and now it stays in whatever gear I put it in. However, having said that I would like to know if these 'improved' detent plates are available from Alexander or other suppliers? As far as I know, I am the only one manufacturing the '61 to '63 Thunderbird detent plate, and certainly the only one with a improved design. I sell them on this site, or you can get them from Bob's Bird House or Pat Wilson. It will make a remarkable improvement in your gear selection. I have had many compliments on the plates. No complaints so far. There are detent plates available for the 1964-66, but they are just reproductions. I don't make them. The cost of the '61-63 Thunderbird detent plate is now $35. It is improved. You can see that this detent plate is much different than what was put in at the factory. You will notice the difference in the park position and shifting when you put it in you T-Bird. The car will lock into the park slot and the large added stop will prevent the lever from popping from Park to Reverse at idle. Hi all, I'm trying ot get ahold of Alexander thru PM and I'm not sure if he is available. I would like to ask him a question regarding the shipping for a detent plate. Does anyone know how I can contact him?